Throughout the week weather forecasts had call for a bunch of snow to hit much of the Midwest around Mid-Friday and pour the snow on until Saturday. It was said that we might get the biggest snowstorm since 2014. Schools let out early Friday and it is a good thing they did because now here is Saturday and we are indeed quite snowed-in. 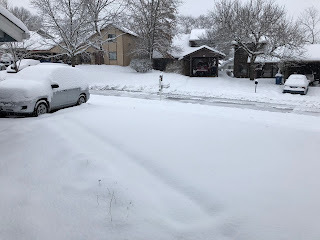 By the time Sunday morning rolls around it should be nicer-out, at least I hope it is because I plan to go to Sunday's Toyman show and report on it! The snow looks beautiful but it is kind of saddening it all happened on a late Friday into Saturday. I mean, who wants all this snow on a day where it won't result in school being cancelled, work telling folk to stay home, or otherwise be useful in the way that, "Snow days," sometimes are? Yes, it is pretty, and by being on a weekend it helps disrupt less plans, so perhaps I'm splitting hairs. Whatever the case, Saint Louis is snowed-in for now. The STL Comics Geeky Extravaganza Was Great Fun! "Black Panther," Got Some Oscar Nominations! I Tried, "Bones," Coffee and Have Opinions!